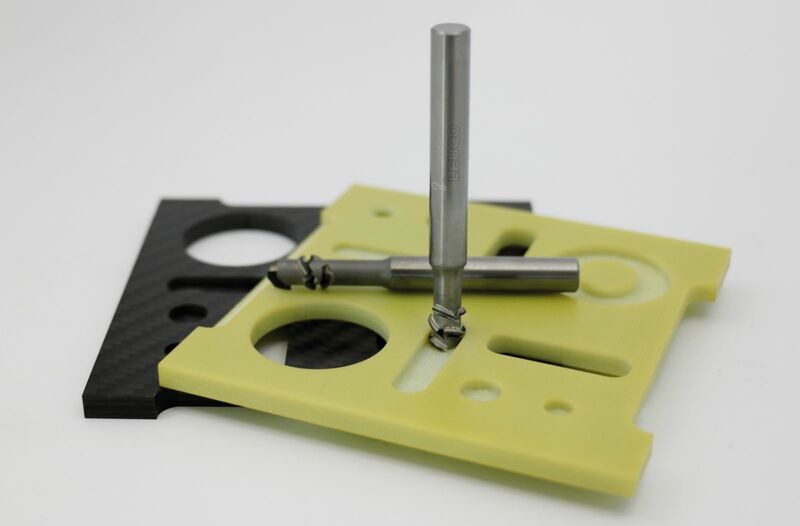 For the machining of fiber-reinforced plastics such as CFRP, GFRP and AFRP as well as other composites LEUCO offers a milling cutter specially adapted for the requirements of these materials – the patented LEUCO p-System shank-type cutter. This DP-tipped milling cutter has a shear angle of more than 55°. This characteristic, which is unique for DP tools, ensures excellent cutting quality with a very long edge life when machining fibrous materials. The cutter is available in diameters from 6.0 mm and can be customized according to the application. Due to the high shear angle, the material-typical machining challenges can be solved: delamination at the top and bottom edges, edge breakouts, burrs and fraying of single fibers or fiber bundles are prevented. Even when milling tough aramid fibers in AFRP good cutting qualities can be achieved without fiber projections. Usually, the machining of fiber-reinforced plastics produces very fine, partly harmful, dust. By contrast coarse chips are produced with the LEUCO p-System which can be extracted very well. Fine dusts are significantly reduced. Depending on the tool geometry, the milling cutter is suitable for a wide range of applications. Designed as a compression cutter the tool can e. g. be used for generating perfect outer and inner contours or for dividing cuts. Designed as a grooving cutter, the tool is very suitable for the incremental scarfing and for generating functional surfaces, pockets and grooves. In addition to this innovative milling cutter, LEUCO also offers the industry further innovative, partially patented cutters, drills and saw blades for processing fiber-reinforced plastics. In 1954, businessman Willi Ledermann and engineer Josef Störzer founded the Ledermann & Co. company – and the LEUCO brand was born. Today, more than 60 years on, LEUCO is one of world's leading full-range suppliers of carbide and diamond-tipped machine tools for wood, plastic and composite material processing. 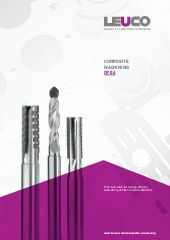 The portfolio covers the entire spectrum of machine tools and clamping equipment. A worldwide sharpening service and customized co-development of optimum tool solutions with our customers rounds off our portfolio and numbers among the strengths of a leading innovative full-range supplier of a wide variety of machine tool solutions. LEUCO sells directly to customers. Our customers are engaged in all areas of wood processing, from saw mills to the finished product, and in a wide variety of plastic and composite material processing fields. Around 1,200 employees work for LEUCO across the globe. The company has subsidiaries in Australia, Belgium, Great Britain, France, Japan, Malaysia, Poland, Russia, Singapore, Switzerland, South Africa, Thailand, Ukraine, USA and Belarus. Inventiveness and technical know-how have been the heart of LEUCO from the first. Numerous patents for cutters, drill bits and saw blades result from this innovative power. Wood is the oldest fiber material known in the world. Machining this material is part of LEUCO's everyday business. It suggests itself to transfer our expertise in milling and drilling of wood-based materials to fiber-reinforced materials such as CFRP and benefit from it. This is what LEUCO does, bringing in additional features such as cutting, floating trimming units and many more.